The Lockheed Martin F-35 Lightning II lifted into the skies today for the first time on December 15, 2006, completing a successful inaugural flight and initiating the most comprehensive flight test program in military aviation history. The most powerful engine ever placed in a fighter aircraft - the Pratt & Whitney F135 turbofan, with 40,000 pounds of thrust - effortlessly pushed the F-35 skyward. The flight of the conventional takeoff and landing (CTOL) F-35 variant began at 12:44 p.m. CST at Lockheed Martin in Fort Worth, Texas, when the jet lifted off and began a climb-out to 15,000 feet. Beesley then performed a series of maneuvers to test aircraft handling and the operation of the engine and subsystems. He returned for a landing at 1:19 p.m CST. Two F 16s and an F/A-18 served as chase aircraft. The F-35 Joint Strike Fighter (JSF) envisions an ambitious flight-test program designed to validate the effectiveness of the world's most advanced multirole fighter. This will be the start of an effort to ensure that schedules are met, costs are minimized, and a mature weapon system is delivered that meets or exceeds customer expectations. The first 22 airframes- 14 flyable aircraft and eight nonflying ground-test articles- will be built on that assembly line during the first phase of the program. The test fleet will include five flyable CTOLs, four STOVLs, and five CVs. Static- and fatigue-test F-35s will be built for each variant, along with a CTOL radar-signature test article. A CV drop-test article will be used for live-fire testing later on. The SDD aircraft will look a lot like the X-35, but the production models will be different from the X-35 demonstrators. Using prototypes to demonstrate the design is a best practice that provides additional evidence of design stability. JSF will not have this type of demonstration before the critical design review. Prototype testing allows the design to be demonstrated before making costly investments in materials, manufacturing equipment, and personnel to begin building production representative prototypes for the system demonstration phase. The JSF program is building an early prototype of the conventional takeoff and landing variant and plans to use this prototype to validate performance predictions, manufacturing processes, and reliability and maintainability models. According to the early 2005 schedule, however, the first demonstrations will occur after the critical design review, after most of the design drawings have been released, and after manufacturing has begun for many of the remaining test aircraft. Any significant design problems found during the prototype demonstrations would likely require more time and money for redesign efforts and retrofitting of test aircraft already in the manufacturing process. If the JSF program cannot meet aggressive delivery schedules for test aircraft, flight testing will be delayed. Flight testing provides key knowledge about JSF performance needed to make investment decisions for production. The JSF program is attempting to develop three different aircraft, for three different services. All want to fly at supersonic speeds, shoot air-to-air missiles, and drop bombs on a target, but they all have vastly different operational concepts. While each of the variants may look similar externally, subtle design differences provide many needed capabilities that are unique to each service. As a result, the program will attempt to design, build, and test simultaneously three distinct aircraft designs. Following the 24 October 2001 Milestone B decision, the F-35 JSFPO Verification and Test (V&T) Integrated Product Team (IPT) began immediately working with their Lockheed Martin counterparts to build the most unique and robust test and evaluation (T&E) approach in acquisition history. The F-35 T&E program is structured to provide accurate, timely, and essential information to decision makers at all levels (JSFPO through DOD) on which decisions can be made throughout the development cycle. The goal of F-35 T&E is to evaluate system performance relative to operational requirements in the intended operational environment. F-35 T&E will identify deficiencies (technical or operational) for resolution prior to production and deployment. The generic phrase "Test and Evaluation" encompasses a broad range of methods and processes to evaluate an air system. The F-35 T&E effort is divided into two areas; Verification and Test (V&T) and Flight Test. V&T is concerned with a broad range of testing and simulation as well as the verification, validation and accreditation of modeling, inspection, simulation and test results. Flight Test is actually a subset of V&T and serves as the ultimate air system level verification methodology. Both V&T and Flight Test areas overlap in terms of methods, responsibilities, results and products. The Integrated Test Force (ITF) was developed to plan and execute the flight test portion of the larger V&T effort. V&T will consist of two basic types; Developmental Test and Evaluation (DT&E) and Operational Test and Evaluation (OT&E). In 2004, test pilots were involved with the continuing development of the F-35's control system, improving the aircraft/pilot interface and control functions. This included numerous simulations in Fort Worth, Texas, and a monthlong effort in the large motion simulation at NASA Ames Research Center, at Moffett Field, Calif., to refi ne control law design. Additionally, two evaluation periods were completed in the vectored thrust aircraft advanced control (VAAC) aircraft in the United Kingdom. This is a specially modifi ed Harrier used to evaluate control concepts for the STOVL aircraft. The NASA Ames facility and the VAAC aircraft allow testing of the design handling qualities in the most realistic environments possible. During 2004 in-flight simulation studies of the F-35 JSF vectored aircraft advanced control Harrier roll-axis were successfully completed. And extensive modifi cations to a Boeing 737-300 - internally and externally - continued for avionics testing to begin in 2005. The aircraft will allow technicians to mimic precisely the F-35 relationship with its avionics, allowing tests and validations to proceed for virtually all systems. An F-35 "cockpit" inside the aircraft will allow more than 20 engineers to perform diagnostics in flight. When compared with schedules of other programs with fewer variables, JSF's schedule to manufacture and deliver in a 5-year period, 15 flight test aircraft and 8 ground test articles is aggressive. For example, the F/A-22 program took almost 8 years to manufacture and deliver nine flight test aircraft and two ground test articles of a single aircraft design. While the first aircraft had only been in assembly for about 8 months, it was already behind schedule as of January 2005. According to the Defense Contract Management Agency, based on the manufacturing status of the center fuselage, wing, forward fuselage, and software development, as of early 2005 the first flight, scheduled for August 2006, could be delayed from 2 to 6 months. Late engineering releases to the manufacturing floor resulted in parts shortages and manufacturing inefficiencies. The first Lockheed Martin F-35 Joint Strike Fighter completed assembly and was ceremoniously turned over to the flight line in Fort Worth, Texas, USA, on 19 February 2006. This represented the next stage of development and the very first completed aircraft. Ground tests will now begin in preparation for first flight later this year. 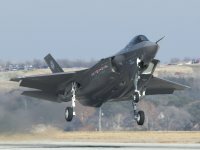 Other program progress includes the successful completion of Critical Design Review for the F 35 conventional takeoff and landing (CTOL) and short takeoff/vertical landing (STOVL) variants on Feb. 17; installation of the Pratt & Whitney F135 turbofan engine on Feb. 13; and pilot manipulation of the F-35 controls and movement of the control surfaces on Jan. 13. Among other recent highlights was "power on" for the first F-35, initiating the flow of electricity into the aircraft in the fall of 2005; assembly start for the first STOVL F-35; signing of the System Development and Demonstration contract for the GE Rolls-Royce Fighter Engine Team's F136 interchangeable engine; and the ongoing success of avionics and sensor testing in ground-based laboratories and flying test beds. DOD planned to begin procuring large quantities of aircraft in 2007 with less than 1 percent of the flight test program completed. By 2010, it expects to have procured 126 aircraft with only 35 percent of the flight test program completed. Concurrently testing and procuring the aircraft adds to the program's cost and schedule risks. The US Defense Department operational test and evaluation annual report warned that ongoing software, maintenance and reliability problems with Lockheed Martin Corp's F-35 stealth fighter could delay the Marine Corps' plans to start using its F-35 jets by mid-2015. This latest report by the Pentagon's chief weapons tester provides a detailed critique of the F-35's technical challenges, and focuses heavily on what it calls the 'unacceptable' performance of the plane's software. The report forecast a possible 13-month delay in completing testing of the Block 2B software needed for the Marine Corps to clear the jets for initial combat use in 2015. On 30 September 2013, the Department of Defense Inspector General released a report entitled "Quality Assurance Assessment of the F-35 Lightning II Program." The report concluded that the F-35 Program did not sufficiently implement or flow down technical and quality management system requirements to prevent the fielding of nonconforming hardware and software. This oversight was said to have the potential to adversely affect aircraft performance, reliability, maintainability, and ultimately program cost. In addition, Lockheed Martin Aeronautics Company (Lockheed Martin) and its subcontractors did not follow disciplined AS9100 Quality Management System practices, as evidenced by 363 findings, which contained 719 issues. According to the DODIG, the Joint Program Office did not: Ensure that Lockheed Martin and its subcontractors were applying rigor to design, manufacturing, and quality assurance processes; flow down critical safety item requirements; ensure that Lockheed Martin flowed down quality assurance and technical requirements to subcontractors; establish an effective quality assurance organization; or ensure that the Defense Contract Management Agency performed adequate quality assurance oversight. In addition, the Defense Contract Management Agency did not sufficiently perform Government quality assurance oversight of F-35 contractors. The DODIG report came as the US Navy's Strike Fighter Squadron One Zero One (VFA-101) hosted a rollout ceremony for the F-35C, the Navy's variant for carrier operations, at Eglin Air Force Base, Florida on 1 October 2013. It was the opinion of the DODIG in its September 2013 assessment that the F-35 Joint Program Office should ensure compliance with AS9100 throughout the F-35 supply chain; ensure that Lockheed Martin approved all design and material review board changes and variances with Government concurrence; perform process proofing of all critical processes to include first article inspections; modify its contracts to include a quality escape (defined as a nonconforming material that had entered the product, supply chain, or proceeded beyond the acceptance process) clause to ensure the Government did not pay for nonconforming product; assess the impacts and risks to all delivered aircraft for all findings; implement an aviation critical safety item program that met the requirements of Public Law and DoD policy, which would include flow down of requirements for a critical safety item program to Lockheed Martin and its subcontractors; assess the impacts and risks to all delivered aircraft for critical safety item deficiencies; perform technical and quality assurance requirement flow down and verification throughout the F-35 supply chain; establish an independent quality assurance organization, which had the authority and resources to enforce the AS9100 standard and F-35 product quality; revise the Defense Contract Management Agency memorandum of agreement to include explicit quality assurance oversight requirements; and ensure that Defense Contract Management Agency was performing quality assurance oversight commensurate with product criticality. DODIG recommended that the Defense Contract Management Agency in turn provide a comprehensive quality assurance oversight plan for Joint Program Office approval to be included in the memorandum of agreement and audit the execution of the quality assurance oversight plan throughout the F-35 supply chain. On 23 August 2013, the Joint Program Office and the Defense Contract Management Agency responded to the DODIG findings and recommendations in the report. The Joint Program Office agreed with 8 recommendations, partially agreed with 2, and disagreed with one. The Defense Contract Management Agency agreed with one recommendation and partially agreed with the second. The Joint Program Office stated that it did not have the resources to perform process proofing of all critical processes nor had the responsibility or resources to perform requirement flow down verification throughout the F-35 supply chain. However, DODIG disagreed because it was the Joint Program Office’s responsibility to ensure contractual compliance to prevent nonconformances. It was also the responsibility of the Joint Program Office to update the contract if the requirements were deficient. In addition, the DODIG included along with the report a Notice of Concern it had sent to the JSF Program Executive Office in April 2012, which said that on average, at final assembly each aircraft had 200+ corrective actions requiring rework or repair. The letter added that the quality management system at LMA's Fort Worth, Texas Plant and the integrity of the F-35 product were jeopardized by a lack of attention to detail, inadequate process discipline, and a “we will catch it later” culture.